In this post, I will discuss how you can create a Windows Live Writer plugin, that allows a user to attach files to a blog post, when the user clicks publish the file will be uploaded via FTP, or directly using your blog provider if its supported. Live Spaces, LiveJournal and Blogger do not support uploading files, in this case FTP will need to be setup via the Tools > Options > Accounts > Select and Edit > Images > Configure FTP. This plugin will work the same as when inserting images onto a blog. The plugin isn’t going to do anything special, I’m sure you will be able to use the other posts i’ve wrote to create something special. To have access to adding files to the blog, your plugin will need to inherit from SmartContentSource and override CreateContent, CreateEditor and GeneratePublishHtml. On this post, I’m only going to implement GeneratePublishHtml functionality. Below is all the code required to add a file to the blog. content.Files.Add takes a filename and a full file path to the file which you wish to upload. When you add the file, LiveWriter copies the file to a temporary location, by using content.Files.GetUri() we can gain access to this temp file path. We then return the html code to insert a download link to the file into the post. When you click publish, the file will be uploaded to the web server and the $ will be replaced with the path to the file on the web server. One problem with this is that it uses the path set in the options dialog, which is used for the images. If you upload any files, they will be put in the same directory as your images. It would have been great to be able to set which directory the files ended up in – maybe a separate dialog setting – or just use a directory called Files instead of Images. So something I forgot to mention so far is now to add an icon to your plugin. The image file must be a bitmap (png) and be 20×18. 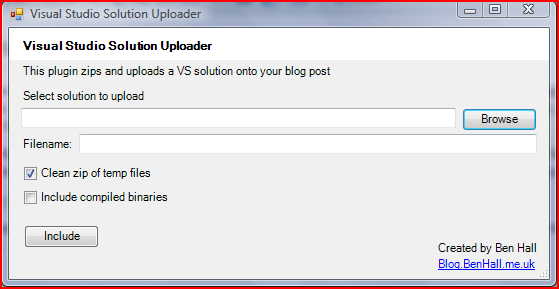 Below is the correct format for a plugin icon, the image is the LiveWriter icon. I haven’t add transparency, but you could if you wanted. 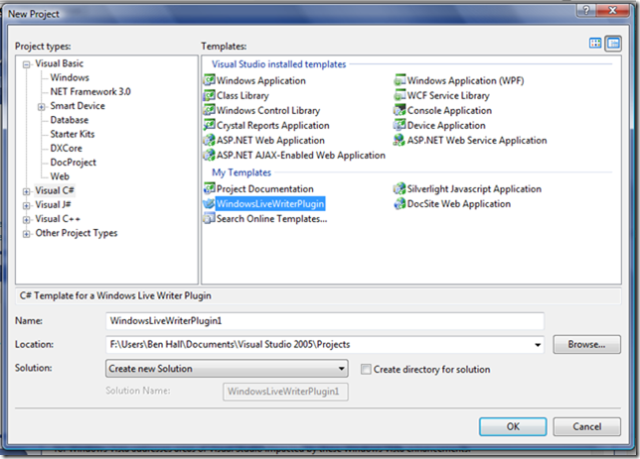 To add an icon, first include it in the VS solution and set the Build Action on the file properties to be an Embedded Resource and the Copy to Output property to Copy Always. Then, in the WriterPlugin attribute, set the ImagePath property to be the image filename “writer.png”. If the image is in a sub directory, then you need to include the foldername in the filename. Following on from my previous post on debugging, the API has a class called PluginDiagnostics. This has got a series of methods for displaying and logging error messages from within your plugin. In this post, I am going to use it to display an error to the end user and log the error message. The method PluginDiagnostics.DisplayError displays an error message. PluginDiagnostics.LogError will log the error message. 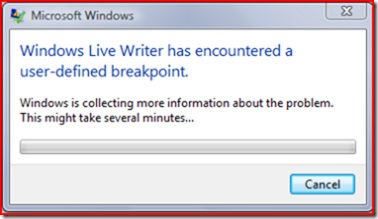 The log file location on Vista is %LOCALAPPDATA%Windows Live Writer, while on XP is it %USERPROFILE%Local SettingsApplication DataWindows Live Writer. Below is some sample code which displays and logs the error. 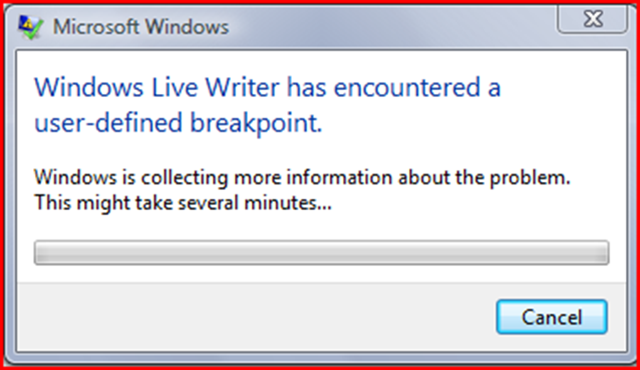 Very useful class, plus the error message keeps it in the style of live writer for a consistent end user experience. Today, as I was writing another plugin example I got really bored setting up the properties, attributes etc so I created a VS project template. 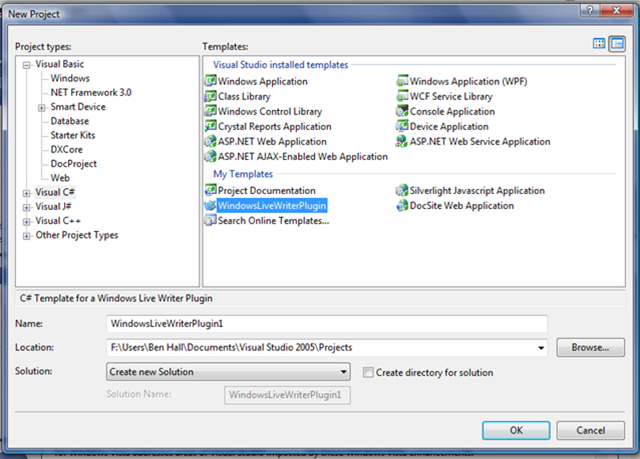 It will then display in your project creation. Hope you find it useful to get you up and running. In this post, I will talk about setting options, or preferences, for your plugin. This is different to the properties as it relates to the plugin on a global/shared level instead of just on the content-specific level in the blog post. If you haven’t read my first post, then that would be a good place to start. To start with, you need to create the standard C# class library, reference the API and System.Windows.Forms, finally creating the attribute. The first task is to set the HasEditableOptions = true in the WriterPluginAttribute. This will then enable the Options button in Live Writer’s preference tab for the plugin. The second task is to override the EditOptions menu which is executed when the button is clicked. OptionsForm is a simple WinForm. Now we have the basic structure in place, we need some way, and place, to save and access the options set. Because this is global, we cannot use the ISmartContent.Properties like we did in my previous post. The API does offer a IProperties object which can be used to store and receive settings for the plugin. This works in a similar fashion to ISmartContent. To start with, we need to gain access to the object. It is actually passed into an Initialize method when the plugin is created, we can simply override this method and store a reference to the object, before calling the base method. On the OptionsForm, I override the constructor to accept a IProperties object. Now I have access to the properties, I add a textbox and a button onto the form and hook up the saving of the value. Finally, we need to output something. Because we are inheriting from a ContentSource object, we need to override CreateContent. I simple try to output the contents of the TextBox to the blog post. And that’s it, you now have an option which is stored for the lifetime of the plugin which can be accessed when inserting content. Tip: Wrap the options with your own class to provide strongly typed access.